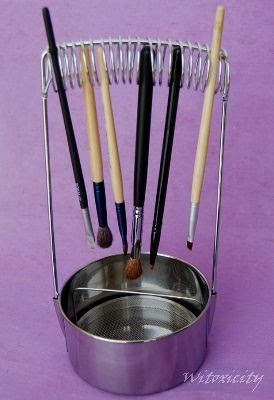 I don’t paint, but perhaps those of you who do, may have come across this brush holder/cleaner before. I’m sure its use can’t be limited to just art brushes, right? I bought this holder middle of last year, an impulse buy. I got home, kept the whole box in the cupboard and with so much happening soon after that, I promptly forgot about it. Well, the holder is finally seeing daylight now! You know what they always say about not leaving your wet makeup brushes to dry with the bristles pointing upwards. The water would flow back down into the ferrule and that can loosen the glue that holds the bristles together. 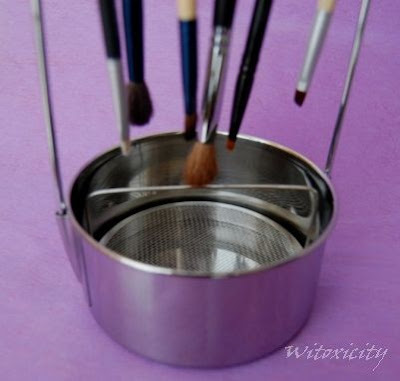 I’ve always left my brushes to dry in a horizontal position, at the edge of a surface, or if possible at an angle so that the brush is pointing slightly downwards. I’d often thought it would be nice to clip the tips of brush handles to pegs on a clothes line (I’ve never given that a try though). 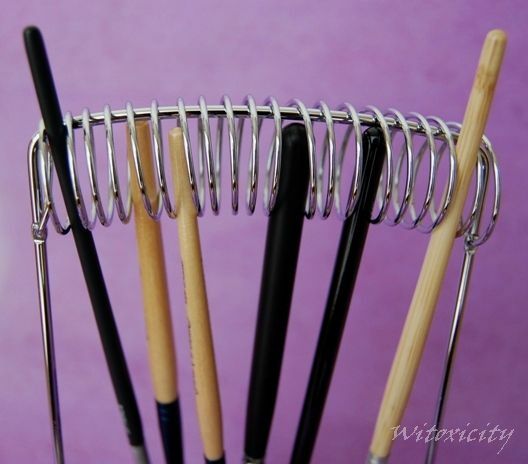 This brush holder would be like my imagined pegs on a clothes line, but it's only a partial solution. There’s no way it can hold a kabuki brush. 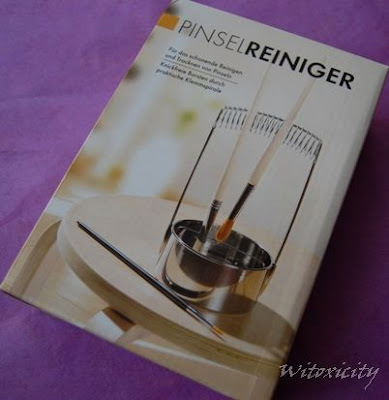 In fact, it can’t hold a powder brush or any brush with a very thick handle. 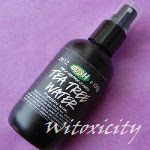 So, I’m afraid its use is limited to smaller, narrow brush handles of less than 1cm in diameter. I think I was pushing it with that thick-handled brush in the middle there (see image). All one needs to do is just slide the brush handle into the tight coil from the sides. I wouldn’t recommend pushing the brush vertically from the under side of the coil as the (tighter) friction might damage the handle's surface. 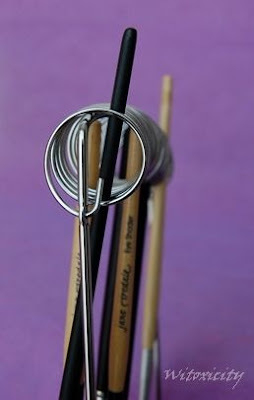 The holder can suspend quite a number of brushes simultaneously but it’s best to balance their positions out on both sides of the coil. It's a handy tool. To me, it’s the standing coil that’s useful. My brushes don’t drip much, so the bottom part (to hold water) is rather redundant. Still, it makes the holder look complete. I believe it's made of aluminium. The base measures 4" in diameter and when assembled, the holder is about 8.5" tall (and it's very easy to take it apart too). Officially, it's called Brush Cleaner (or Washer). 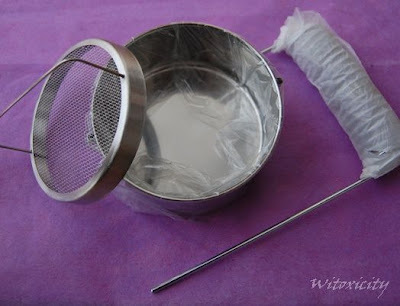 The removable mesh screen is good for cleaning paint off brushes, but since my brushes are simply for makeup, I've never had to use that portion. I can't remember now how much exactly I paid for it, but it was cheap (probably €3 or €4). I got it from Lidl but a little checking on the internet shows that it's also available through Amazon and some online art supply stores. 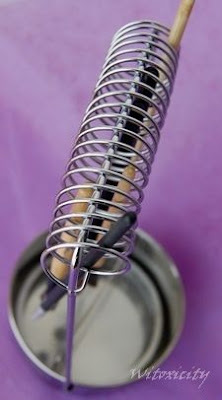 You can always try cable tying or twisty tying larger handle brushes to one of those loops. It kind of sounds like a good idea! this is so convinient!! i would love to get one of these. 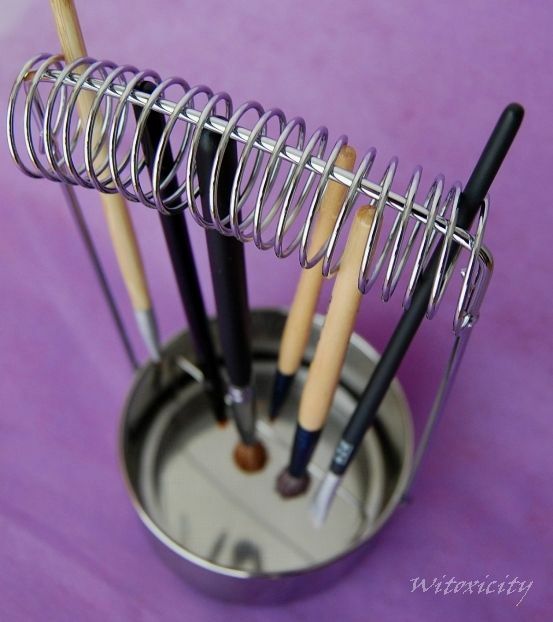 cool.. i would like to try to make a DIY version of this.. thanks for sharing..
Looks cool, but still prefer my brushes to flat dry on a towel. Oldschool but works best for me. Oh how neat~! Someone in the makeup industry has GOT to take this idea up and mass produce this!